"Hi, I'm Roseann over from Rosebud's Cottage. 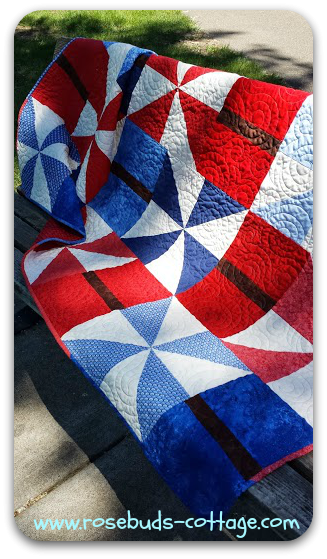 If you need a table covering for your picnic, a place to nap under a tree, or a throw to snuggle under while you watch the fireworks, "Sparklers!" is for you! 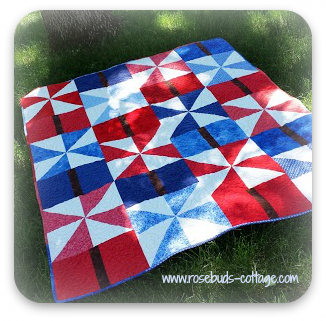 With its fast piecing method, and large pieces, it is perfect for a last-minute Fourth of July project. Best of all, the directions are linked in pdf form, so you can print them out and take them with you! "I hope you'll enjoy Sparklers! ... my next project for Fabri-Quilt's Inspired By Fabric blog. A few weeks ago, Fabri-Quilt sent me a box of red, white, and blue fabric to design with, and fortunately, I had an idea in my head that worked perfectly! I wanted the project to go together very quickly ... that's why there are large blocks and shortcut piecing methods. The blocks finish at 13 1/2" x 21 1/2" so as you can see, it doesn't take many to make a nice size quilt!"